162 people on flight to Singapore which never arrived at its destination; air and sea rescue effort launched. Indonesia air traffic control has lost track of a flight to Singapore, Indonesia's air transportation director general, Djoko Murjatmodjo, told AFP Sunday - with 162 people on board. 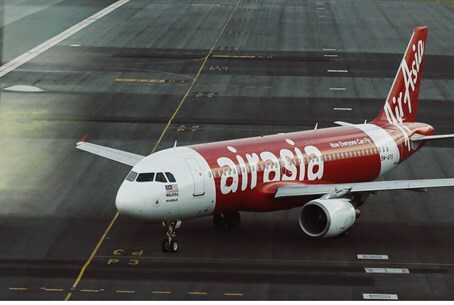 AirAsia flight QZ8501 from the Indonesian city of Surabaya to Singapore, an Airbus A320-200l, lost contact with air traffic controllers on Sunday morning, and air and sea rescue searches have begun, AirAsia stated on its Facebook page. The flight left Juanda International Airport (JIA) a few minutes after its regularly scheduled flight time of 5:35 am local time and was due to arrive in Singapore three hours later, at 8:30 am. The aircraft lost contact with Jakarta air traffic control at 7:24am local time, it said - 42 minutes after departure and an hour before it was scheduled to land. Yahoo! News reports that contact was lost while flying over Pulau Belitung. The pilot may have asked for an unusual route, according to the Independent, but the request to Air Traffic Control may have been to avoid a thunderstorm by climbing to a higher altitude. Murjatmodjo said that of the 162 people on board, seven were crew and 155 were passengers - 138 adults and 17 children, including an infant. JIA's general manager Trikora Raharjo told the Associated Press that of those on board, 149 were Indonesians, three were Korean, and there were one citizen of the UK, one Malaysian, and one Singapore resident on board. While some concerns have been raised that a faulty airliner is to blame for the disappearance, following multiple in-service issues with the Boeing 787-800 "dreamliner" in recent years, the Airbus A320-200l has a "superb" safety record, according to the Independent, and the last crash was six years ago in Honduras. The missing AirAsia flight is the second to disappear without a trace in the area this year, nine months after Malaysia Airlines Flight 370 disappeared over the Indian Ocean on March 8. A range of theories as to that flight's fate have emerged – from hijacking to crashing to being diverted for use in a terror attack, possibly against Israel. Later theories have become even wilder, ranging from an onboard fire to a suicide mission. Controversy reigns over every detail of the flight, including the co-pilot's last words - "All right, good night" - and the fact that two Iranian nationals with stolen passports were on board. The latest publicized theory in June predicted that the 239 passengers and crew died from hypoxia, or oxygen deprivation, building on earlier analysis pointing to fuel starvation. A Helios Airways flight in 2005 crashed under similar circumstances.